As a matter of disclosure, GoDaddy.com is who I host my blog (ScottWritesEverything.com) through. And, as a paying customer, I am on their email list. I would classify GoDaddy as pretty aggressive in their campaigns, always harping on discounts and deals to get additional sales. My being a sole-domain-long-term customer, I am clearly not their bread-and-butter customer. The subject line got me to open immediately. “Was it something we said?” is clever, and I opened without hesitation. A reminder of the value proposition in the body copy is good. A prominent deadline and prominent calls to action are well-placed both at the top and bottom of the main message. I own a single domain and have purchased hosting and the domain name for 5 years. I’ve made no other orders before or after, and it’s been nearly 9 months since that purchase. What sort of engagement metrics are being used to push further orders if I’m a single purchase customer? Seems odd that the message would be signed by Bob Parsons, the founder. I know as customers we’ve become sophisticated to the point that we acknowledge it’s all “marketing” anyway, but I would always push for a level of credibility in the voice if at all possible. And I doubt that Bob is concerned about a 25% off of $60 purchase deal. All in all, this is another message that has some solid work put into it. About the Author: Scott Cohen is the Marketing Copywriter for Western Governors University. He also writes on email marketing, fatherhood, sports, and politics on ScottWritesEverything.com and contributes to the Email Zoo Blog. Nice thoughts Scott. Love the subject line and agree with you on the header size. As always…good stuff! Scott: Thanks for nice comment. 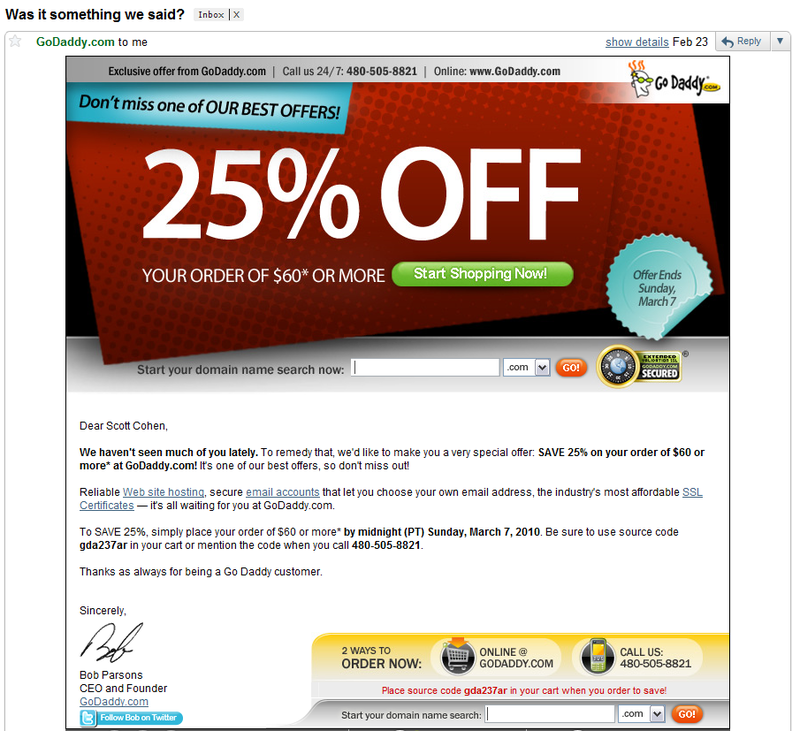 This email from GoDaddy has been standing out to me for a couple of months, just finally got around to writing a bit about it. Glad you agree. Will be interested to see if others do as well. We just started work on a new re-activation campaign this morning so of course I had to take a read. All of your points are good as usual. I’ve been stuck on the subject line but will include something similar to this as a split test. I always have to shake my head when I get an email from the President or CEO for the same reason you pointed out. I also wonder how many people jumped on the opportunity to follow a domain registrar executive’s tweets. Peter: Thanks for the comment. I agree with you on the head-shaker. There’s a level of credibility missing when it comes from the CEO. A clever idea would be like the “VP of Giving You a Great Deal.” Same lack of credibility, but at least it’s tongue-in-cheek funny (in my head). Thanks. That was good too…especially when I got to the part about reactivating an address they hadn’t mailed to in 5 years. I think the L.A. Times should have had one version for inactive addresses and a totally different message for those recipients that they lost for the past year…or 5 years. Although the header is HUGE I do like it. They could of also use HTML text to show the 25% off. Another thing I see missing is the pre-header. Mucho important especially when dealing with BIG images at the top of the message or discounts.